In honor of the weekend now upon us (three cheers! ), I wanted to share a look from this past weekend. Fresh off the heels from the Miami heat, it was a bit shocking to actually have to wear longer sleeves back in SF -- but I'l admit, I'm a wimp when it comes to humidity so I was secretly rejoicing. This skirt, thanks to Banana Republic, is currently on my weekend to weekday rotation list -- stay tuned to see how I style it for the office next week! But let's not get ahead of ourselves here -- weekend plans, whose got em? Spill! Adorable and chic outfit girl! LOVE THE COLOR OF THAT SKIRT AND OF COURSE STRIPES ARE ALWAYS A WIN! Chic, classic and fun! The skirt is absolutely stunning! Love this outfit! The stripes, the skirt, the sandals! Amazing! love the outfit! cute bag! So cute and perfect weekend wear!!!!! Thats a very lovely look. Perfect for weekend! P.s. Just found your blog via Bloglovin. Really enjoying it! Oh my goodness, I absolutely love your skirt! I've been seriously debating getting this Jcrew hat! I just can't pull the trigger on it! But its my 21st birthday on Saturday! I've been eyeing that skirt for a while. Really like it...I'm thinking about the orange color. Love stripes, and Zara, I think it's time for a little online shopping!! Your cobalt pleats are adorable! I love the color combo of brown, purple and black, I never would have thought of that! I'll have to try it now, thanks! hmm weekend plans? hopefully some time in the sun with my boys (the husband and dog). 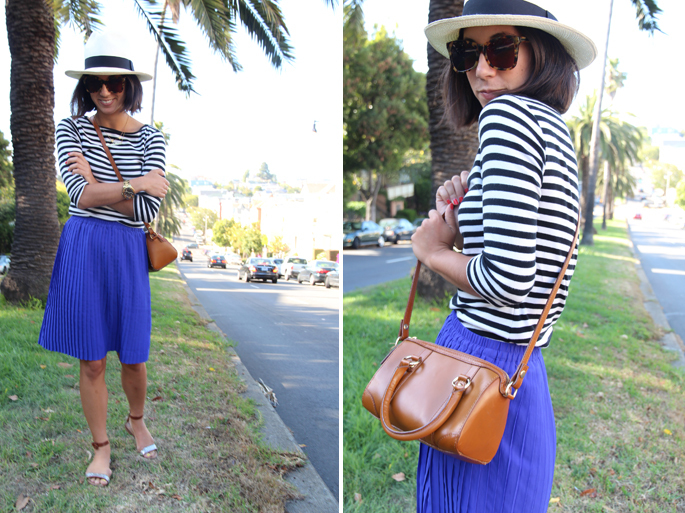 There's something so relaxing and classic about stripes and a pleat skirt. Love it! What a funbut classy outfit!! Perfect for the weekend! I love you in the hat and sunnies! So casual chic! Such a pretty skirt - definitely in the wardrobe staple category! Weekend plans - bunco, water park (I hope they sell beer! ), and the drive in movies! Yay for stripes and pleats! This looks amazing! Adorable. 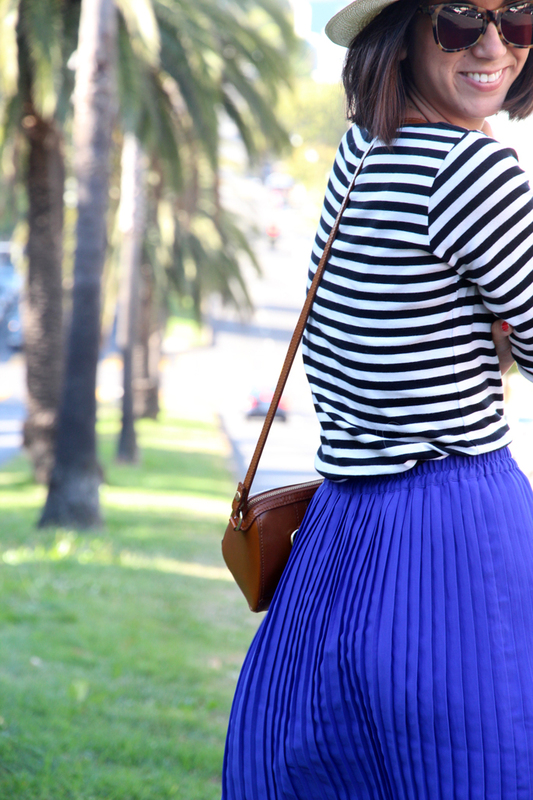 Love the stripes with the bright blue skirt. Great weekend look! You look so cute, hope you have a great weekend. 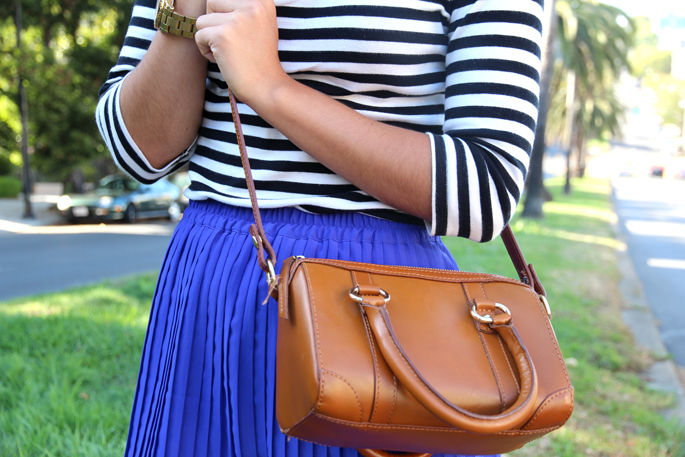 i can't get enough of cobalt or pleats! SO cute! wonderful outfit! looks just like something i would put together! i love this look, its so cute! I want that skirt! The bright color and pleats are adorable, and I love how you styled it up with the stripes and bit of sparkly in the shoes. In 2 weeks I'll be coming up to SF! Can't wait! Love the look and just wore a similar color/stripe combo! I like to think we are on the same fashion wavelength!